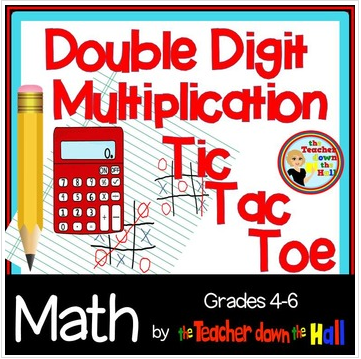 Give students a partner, a calculator, and a couple of blank pieces of paper and those 10 repetitions of double digit multiplication problems will get done in no time. They’ll get immediate feedback from their partner and because no grade is taken, lots of practice with no pressure. I’ve had students teach the concept to others that were absent on initial instruction day, and others ask to play this game during recess! I love Double Digit Multiplication Tic Tac Toe day! • Please go to your My Purchases page (you may need to login). Beside each purchase you'll see a Provide Feedback button. Simply click it and you will be taken to a page where you can give a quick rating and leave a short comment for the product. Each time you give feedback, TPT gives you feedback credits that you use to lower the cost of your future purchases. I value your feedback greatly as it helps me determine which products are most valuable for your classroom so I can create more for you.